In a little less than a year – February 1st, 2014 to be exact – David Stern will retire from his post as NBA commissioner after an overwhelmingly successful 30 year reign. Stern’s marketing driven sports philosophy propelled the league from near extinction into an insanely lucrative global brand. The poster child (quite literally) for Stern’s multi-decade strategy is Charlotte Bobcats’ owner and G.O.A.T. Michael Jordan, who ruled both the court and the cameras during the league’s exponential growth period during the ’90s. 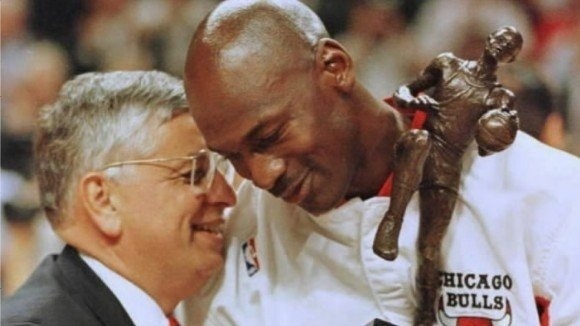 Stern created the conditions for an international phenomenon like MJ to exist and Jordan took full advantage, elevating the game and league to heights Stern quite possibly couldn’t have imagined. The one and only, Michael Jordan struts in from stage right holding a jersey of his own. Nearly thirty years later to the date, Stern and MJ shake hands at the Draft podium for a second time. “Michael, it’s been an amazing run.” Crowd going nuts. Jordan unveils the teal and purple. “Finally, we’d like to welcome the Hornets back to their home in Charlotte.” Boom. A former player – an African-American mega-star – standing equally alongside two white billionaires and a Jewish attorney representing the NBA’s past, present and future – this is Stern-ian theatrics at its best. Crazy speculation? Certainly. Does it fit with the Commissioner’s thirty year modus opperandi? Without a doubt. Charlotte Bobcats (Hornets) 2018-19 NBA Champions !! !